Bar arcades are a hip stop for everyone on a Saturday night. Here are the best of them for button-mashing boozehounds in Los Angeles. Want great local beer while taking bar games back to their roots? 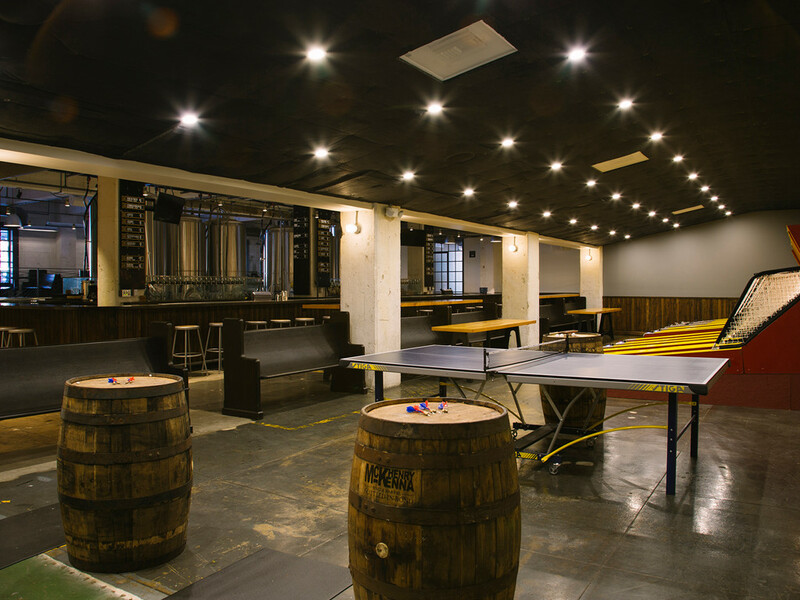 The Arts District Brewing Company in downtown LA offers more tactile games (ping pong, foosball, and skee ball) and tactile beers (nine original beers brewed onsite). Go back further than analog at the Arts District Brewing Company and chill out in the festive atmosphere with friends. It’s perfect for a Saturday or Sunday afternoon, even. Proudly declaring itself a dive bar, Blipsy Bar is located in the heart of Koreatown and offers a more organic experience than the more upscale bar arcades. It feels like the owners inherited arcade games (like Rampage and Spy Hunter) from an estate sale and decided to make it work. And it totally works. The wells come cheap and easy while you pound away quarters with plenty of room to socialize or get lost for an hour or two (or all night). Button Mash is the perfect mix between upscale and hipster. 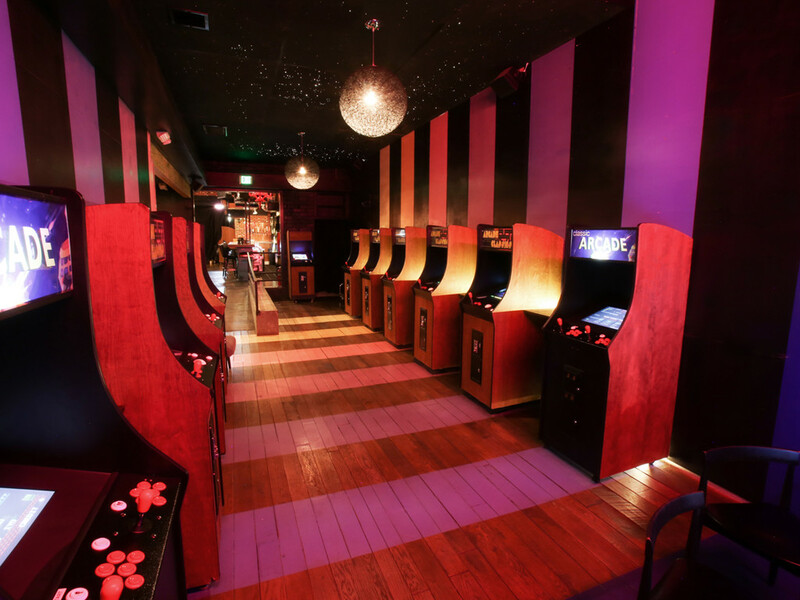 Located along Sunset Boulevard in Echo Park, this minimalist venue has plenty of room to get in deep with a nice selection of old arcade games – Dragon’s Lair, Star Wars: Return of The Jedi, and Toobin’, to name a few. It also has a healthy selection of rad pinball machines to bump and tap for hours. Additionally, this place offers a lot of vegetarian and vegan options. The full-service restaurant is perfect for when you need to take a break and recount your epic battles with friends. Located in the fancy Art District downtown, EightyTwo is impressive. Featuring a cool, neo-modern design and tons of games, you’ll find yourself in the center of a hip hot spot with DJs and plenty of celebrity sightings. Sure, it gets a bit crowded, but when there are classics games like Donkey Kong, Final Fight, Mortal Kombat II, and Ms. Pacman, you won’t mind. 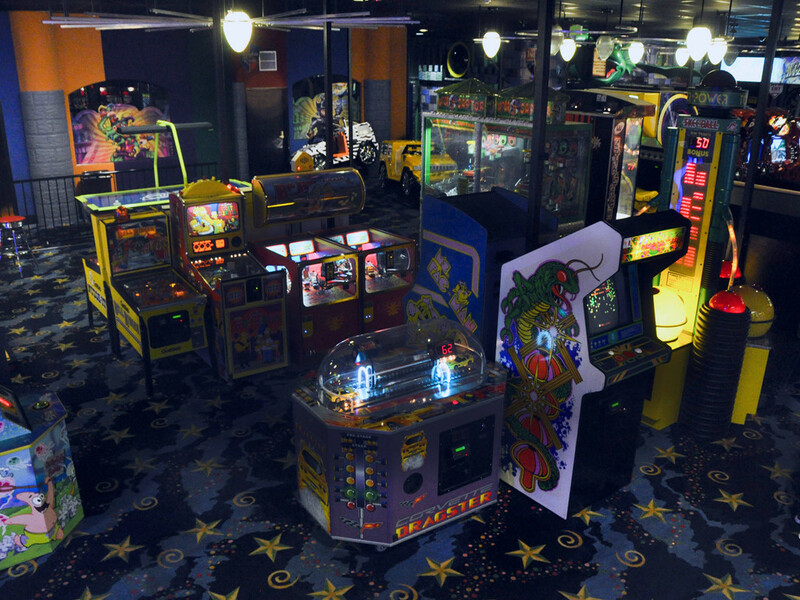 The rows of pinball machines will leave you in awe. Go big or go home at Games & Thrones. 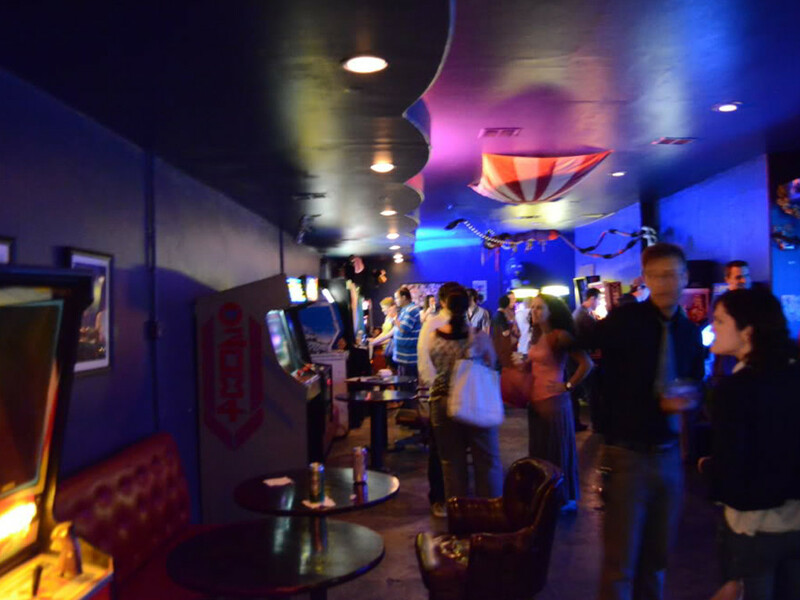 This Burbank bar arcade makes drinking and gaming an event. Like a classy Chuck E. Cheese for adults, at Game & Thrones you and your friends can play the latest arcade games to win tickets and cash them in for prizes. Need a space for a work social or want to have a nostalgic birthday party? Games & Thrones is your ticket. 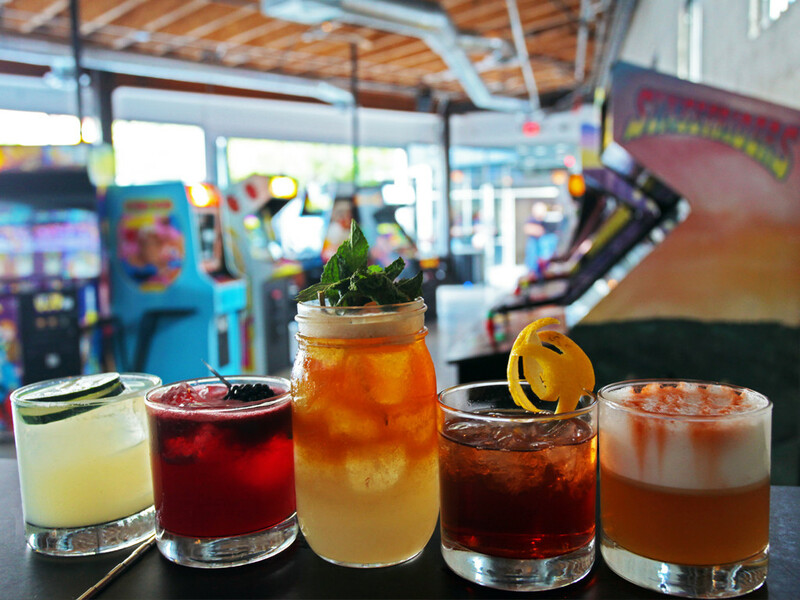 Though it may be a trek for some, The One Up in Sherman Oaks is a different kind of bar arcade, because the games are FREE for all customers. With a great variety of finger foods on the menu (corndog pops, avocado summer rolls), it’ll seem like happy hour lasts forever. Resembling Flynn’s Arcade from the film Tron, The One Up is a very cool bar arcade.